A call to Charles Ehrardt in the Antibes office of Camper & Nicholsons brings the welcome news that at noon today he completed on the sale of CBI Navi's 39.69m megayacht Commitment with Enrico Mortola of Mortola Yacht & Ship acting for the buyer. Built in 1989 and refitted in 2007, she sleeps 10 guests in a full beam master, two doubles and two twins and cruises at 12 knots. 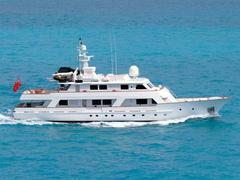 Charles tells me that Commitment was asking €4.5 million and she's now under the management of Mortola Yacht & Ship.